Yay! Time for another slice of happy pie! Fake engagement woes and jealousy combine! Ahem. This episode gets a song dedication thanks to all that Tae Ik quietly does for Man Ok that she doesn’t realize. It’s Fahrenheit’s “默默” (aka Momo aka Silent love, quiet love). Tae Ik is looking all chilled out and relaxed until Man Ok sits down and says she can’t go through with the engagement ceremony after all. Seriously, girl, it’s a wee bit too late to back out now. Meanwhile, the press have gathered for the ceremony and before it begins, they get to watch Tae Ik’s and Man Ok’s “love story” which is from their photography shoot earlier. Back in the room Tae Ik’s voice raises and then he remembers the reporters. Now begins a fun argument because it’s done completely in angry whispers. LOL. Tae Ik can’t believe Man Ok’s really dropping out now of all times. Man Ok asks if they are really getting engaged like this then. Tae Ik then tells her it’s her fault they ended up like that to begin with. Man Ok then throws back that he’s the only reason she’s doing this (meaning its for his sake). Now we start going back and forth in the blame circle. Tae Ik then demands to know why she fainted at the broadcasting station. Was it staged by any chance? Unbelievable. Man Ok then says the fault originates with him because he was the one who carried her in and laid her down in the trailer isn’t he? Man Ok’s “You sneaky wolf” comment has Tae Ik’s temperature and blood pressure rising and he forgets he’s supposed to be arguing in hushed whispers.”WHAT???????????? ?” And, of course, we cut back to what they are saying about how their love has grown for one another over the course of three years. LOL. Their argument would prove otherwise as they are also having an intense stare down. Is Man Ok crazy? Man Ok’s reply? “Let’s take a hit this once and go to the hospital.” That way the party will be cancelled. Seeing Man Ok’s raised fist, Tae Ik worriedly tells her not to do it. Of course he doesn’t want to get punched by that girl—she’s surprisingly strong. Man Ok tells him it’s just once and gets up and raises her first while he cowers on his corner of the couch. At this time Go Dong enters and Man Ok immediately straightens up and turns. Go Dong looks like he caught them in the act of something or about to do something. He clears his throat and announces it’s time for the “happy” couple to go out. While walking to the ceremony room, Man Ok keeps nearly falling over. She is wearing high heels, which she has worn before in the past and she had even been jumping in them a little bit in the last episode so it’s odd that she’s stumbling around here, unless you account it as a bad case of nerves. I’d also like to point out that heel size matters. I can wear 2-4 inch heels if they are thick, rubber heels of boots. I cannot wear thin or spike heels of ANY size. Why? Weak ankles and bad knees. Just thought I’d point that out. Go Dong nudges Tae Ik to help her, but he just can’t bring himself to do it. How bad does it look that they are walking in with Man Ok independently in the front and Tae Ik behind? They arrive at the door and stand together. Tae Ik then takes her hand. I think it’s not just for show, but to comfort her as well. Deep breaths and the doors open and they walk in. Does anyone else think that “Love Note” by Ailee has strains of “Somewhere Over the Rainbow”? Man Ok goes home and is greeted by Nora and Ga Ryeong. They startle her. Is Man Ok really getting engaged to Lee Tae Ik? Man Ok looks away. Clear proof that it’s all a lie, but Ga Ryeong reads this as Man Ok really lying to her for three years and sneaking around with Tae Ik. Man Ok assures her that isn’t the case. She couldn’t tell Ga Ryeong because she knows how much her best friend hated Tae Ik. Good cover, I half expected her to spill the beans completely when faced by her evil, obnoxious, selfish, idiot of a “best friend.” Ga Ryeon still considers it a betrayal. Nora then jumps in. Is this really true? She then faints. Man Ok becomes instantly worried. Ga Ryeong then asks if Man Ok wants to piggyback Nora or open the door. Man Ok opens the door as Ga Ryeong piggybacks the girl inside and dumps her on the dojo’s couch. Man Ok asks if Nora is really okay. Ga Ryeong tells her not to worry as Nora does that sometimes when she talks about Tae Ik. Omo. How…extreme. Fangirls…I just don’t get them, not at all. That aside, Ga Ryeong continues the topic from earlier. How could Man Ok do this to her? If Man Ok is getting engaged, shouldn’t she be consulting Ga Ryeong and grandfather? Ga Ryeong then makes a vomiting motion. Is that why the sudden engagement? Man Ok firmly denies being pregnant. She has to be if she didn’t tell Ga Ryeong or wait for her grandfather to be home. Man Ok then yells she did it because she just loves him so much. LOL. She loves him to death to the point she can’t live without him. Is that okay? She then angrily huffs off. Ga Ryeong and Nora then go and out drinking and bash Man Ok. Enter Seo who tells them to stop acting up and he shows them the banner for their newly established company. Ga Ryeong screams that Man Ok is a traitor and passes out. Meanwhile, Man Ok is wearing earplugs to try to cover the sounds of the angry fangirls outside. She then hears the sound of shattering glass. She rushes out and rocks have been thrown through the windows of the dojo. The police are outside doing their best to hold back the angry fangirls. Man Ok starts cleaning things up and unwraps one of the notes which has “Die” written angrily on it. 😦 Poor Man Ok doesn’t deserve this treatment. Hell, no one does. Again, fangirls…especially the extreme ones…I don’t get them. Man Ok sadly packs to move into Full House at Bum Soo’s orders. It has been okayed by Joon and will ensure Man Ok is as protected as they can make her during the chaos of the upcoming months. She then sees her practice uniform and sighs deeply. She apologizes to her grandfather. She and Go Dong arrive and Man Ok notices the construction is ongoing. If that’s the case, then where will she live? In Tae Ik’s annex! They enter and Go Dong yells for Tae Ik. Man Ok shushes him as Tae Ik must be sleeping. Go Dong shows her to her room while Tae Ik peeks around the corner. Omo, omo, omo. Such a kid uri Tae Ik-ssi. Man Ok’s room is small, but bright and colorful. Go Dong hopes that she likes it. Man Ok says that she does. Go Dong then tells her to get some rest. He then pauses and awkwardly admits he doesn’t know how to call her (now that she’s engaged to Tae Ik). Man Ok smiles and tells him to call har as he normally has. Go Dong smiles and wishes her good night once more telling her once again to contact him if she needs anything. Go Dong is such an adorable side character. I love him. He leaves and Man Ok bounces on the bed before angrily cussing Tae Ik out as a rude b*stard for not greeting her when she moved in, lol. This is SO typical between these two at this point. Tae Ik, meanwhile, is hovering around his door listening. Go Dong comes to the room and asks if he’s sleeping. The anxious Tae Ik quickly rushes into his bed and poses with a book before saying he isn’t asleep. Go Dong enters and scolds him for not greeting Man Ok. Tae Ik replies if Stylist Jang is there, then she’s there. Go Dong then scolds him for calling Man Ok by her title. What’s wrong with that? It will look bad if Tae Ik keeps saying that in front of others since they are now supposedly engaged. This shocks Tae Ik. Did Man Ok says that? No, Joon. LOL. Is Tae Ik-ssi disappointed that Man Ok didn’t request it? Tae Ik later goes to her room. He’s so awkward as he hesitates and calls out to her. He then enters when he gets no reply and is angry she went somewhere at that late hour since the room is empty. Where could Man Ok be? In the basement with the loveable Kang Hwi! Who chokes on what he’s eating when he hears Man Ok has moved into the house. With Tae Ik? Man Ok nods. Does that make sense? Man Ok explains she had to or else keep causing problems for her poor neighbors. Kang Hwi still protests since a grown man or woman shouldn’t live in the same house together. He then stands up. He’ll get her a hotel room or even better a house or studio apartment. Whoops. He has no money and all his cards have been suspended. No saving Little Red Riding Hood from the Big Bad Wolf. He sits down dejected and Man Ok tells him this is better because she can now come see him more often. This, of course, brightens are little cat’s mood. He is still worried about Man Ok being stuck with the rude Tae Ik. Man Ok assures him she’s rather used to him, so nothing to worry about. Kang Hwi goes back to eating the ice cream, but does wonder how Tae Ik who hates people entering his house could permit such a thing. Tae Ik is lying on his bed and he recalls what happened earlier. He was with Go Dong outside of Man Ok’s house. Tae Ik sees the angry mob and asks what’s going on. Go Dong replies it is Tae Ik’s sasaeng fans (the worst of the worst of fans who take things to horrible extremes). Tae Ik immediately instructs Go Dong to call the police so nothing horrible happens and to also call the company about the problem. Awww. All the good Tae Ik does never gets noticed since he acts more in the shadows. In fact, Tae Ik was the one to suggest Man Ok come live with him. Tae Ik goes down to the kitchen for a drink of water as Man Ok is coming up from the basement. She jumps when she sees him. Tae Ik’s response is did she do something wrong. LOL. Why was she walking around the house so late at night? Man Ok says she had problems sleeping. He then scolds her for leaving all the lights on. Does she know how much the electric bill is? Man Ok promises to be more careful and then scolds him for scolding her on her first day in the house. Tae Ik cuts her off and tells her not to wander around or be an eyesore. Man Ok promises to act as if she was dead so he won’t know she’s around. What…an extreme thing to say. Of course we all know Tae Ik doesn’t really want her to be as quiet as a church mouse. Of course, that doesn’t work out at all. He sees signs of Man Ok in the shower, in his cosmetics, in his missing foods and drinks. He even brings out his stuff to take inventory. LOL. Oy, Tae Ik. Man Ok is getting food when he comes down, scaring her yet again. He then accuses her of all the stuff that’s been going on (wonder if it’s really Kang Hwi-nim?). This surprises Man Ok, but she catches on what he calls her more and more – Jang Man. He refuses to add the Ok because it’s bothersome. LOL. This annoys Man Ok, which I can’t blame her, I get mad all the time about my name. It’s NICOLE not NICHOLE or NICKOLE or NICHKOLE. Sigh. It’s a pet peeve. Of course, that has to do with spelling, but still, I get it. Tae Ik tells her to stop evading and answer him. Man Ok asks what the problem is and Tae Ik lays down everything that’s been touched and went missing. Man Ok’s response to this is he’s totally petty. Tae Ik at first agrees until what Man Ok says catches up to his brain. What? Petty? Yep, he’s completely petty for a Hallyu star. Tae Ik, like a little boy, says that’s no the point. Did she or didn’t she use all of his stuff. Man Ok angrily goes to tell him she didn’t as she’s not crazy when she recalls Kang Hwi-nim and quickly changes it to she must have wandered around crazily. Why? Does Man Ok walk in her sleep? Man Ok then says she’ll replace everything and goes out to the garden to eat since she feels stifled. Tae Ik watches her leave in wonderment. Was she always that shameless? In the basement, where Man Ok was really going with the food, she tells Kang Hwi to be more careful upstairs as it’s causing havoc with Tae Ik. Kang Hwi says he did it all on purpose because he’s angry that he’s locked down here while Tae Ik lives upstairs and is even engaged to Man Ok (fake or not). Another little boy. Man Ok puts on a smile and tells him he should still be careful to not get caught. Kang Hwi smiles and says he won’t do anything more to put her in a tight spot. Man Ok then notices a bruise on his arm. What’s that? Kang Hwi pulls his sleeve down and says he has night blindness and bumped into something. Man Ok then tells him not to go around at night then, especially since he’s on crutches. Kang Hwi feels stifled if he doesn’t move about when he can. He then sees a kitty on the tray. If he had a cat, it would be less boring. Oh, no, This won’t be good. Man Ok goes to the pet store and picks out a kitten. When she returns, she quickly hides the picnic basket containing the cat behind her and goes up to Tae Ik to ask what’s going on. He tells her he’s installing a CCTV thanks to her. LOL. He then starts sneezing. What does she have. Man Ok says it’s only a picnic basket. The weather has gotten nicer so she wants to have a picnic outside while sunbathing. She quickly rushes off leaving Tae Ik sneezing like crazy. His nostrils flares. What is this? Kang Hwi is really happy to get the little kitten. Man Ok picks it up and tells him it’s a present. Kang Hwi is really happy. Man Ok tells him he’ll be less bored now. Kang Hwi thanks her again. She tells him she was almost caught smuggling the cat in by Tae Ik. Kang Hwi then says he’s happy having his smuggled kitty because he knows how much Tae Ik would hate it if he knew. Wow. Kang Hwi-nim has a vindictive streak that’s really coming out right now. Man Ok then tells Kang Hwi that Tae Ik had a CCTV installed in the annex. Kang Hwi curses Tae Ik again, but says he’s okay since he has the kitten which they name Chaton as that is the French word for cat. Tae Ik is monitoring the CCTV when he sees Man Ok in the living room waving at the camera. He immediately pulls out his phone and calls her. What is she doing? Can he see her? That’s why he called her. Man Ok tells him to hang on and disappears from the camera. Can he see her now (in the hall by the basement door). Tae Ik smirks and says he can. She then moves and she completely disappears from all screens. Hahahaha. Man Ok is finding the blind spots for Kang Hwi-nim. He asks where she is and she jumps in front of another camera. She’s surprised that he even installed the camera in the kitchen. Her face and lips get close up to the camera and Tae Ik’s heart starts beating like crazy. LOL. He even goes to touch his own lips. Oh, how funny. He likes her like crazy without knowing it. Man Ok then delivers a map to Kang Hwi that shows the camera positions and where the blind zones are. 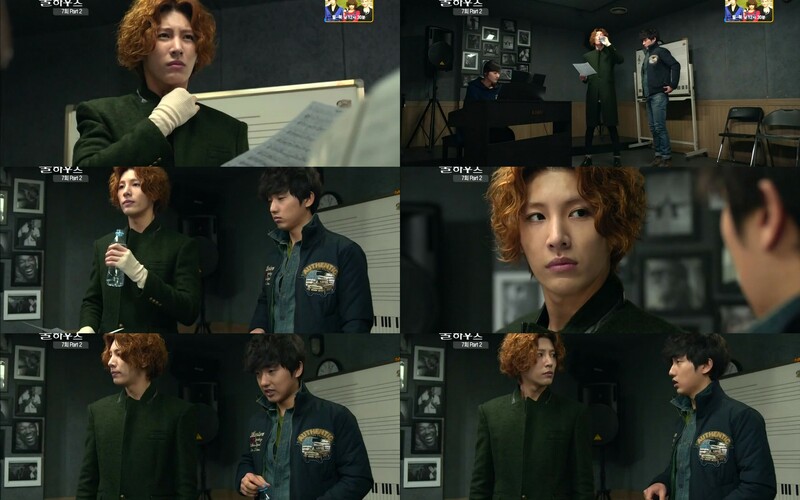 This surprises Kang Hwi and Man Ok smiles happily. Ah, these three are just so cute. Kang Hwi then comes out at night and notices Man Ok has put something on the floor to show him the way. Not quite sure what they are. He then takes another look at the map and begins his movement. The next morning Tae Ik is monitoring the cameras yet again when Man Ok knocks on his door. Isn’t he going down to the practice room? Tae Ik says nothing and just stares at her lips. Seriously. With…I’m not sure how to call that expression. It’s intense though. Man Ok then asks if there’s something on her face since he’s staring at her so intently. He then flashes back to her kissy mouth and his heart starts pounding like crazy again. He looks confused. He shakes himself and quickly leaves his room. Man Ok then wonders why he’s like that. Tae Ik is practicing his new song. It’s kind of horribly off key and he can’t even hit the high notes. He stops and Go Dong gives him water. Tae Ik says his condition isn’t good and Go Dong replies he’s done better than usual. Glare. LOL. Tae Ik then calls a halt to practice even though he hasn’t been doing it long. Go Dong is worried. Is Tae Ik’s condition really not that good right now? Another glare. Meanwhile, Man Ok is in the basement sniffing Chaton who reeks. Just what did Kang Hwi feed him? Kang Hwi responds his left over sandwich was on the floor and he thinks the kitten at the rest of it including the onion. Man Ok scolds the kitty and sniffs again. They need to wash the cat. Kang Hwi wonders if they should do it at night. Man Ok looks at her watch and says they can do it now since Tae Ik has gone to practice. They feed the kitten milk and Man Ok leaves to get the bath water. Kang Hwi sits down and pets his new friend. He then sees someone coming and grabs the kitten and milk and hides under the counter again. It’s Tae Ik still trying to sing his new song. He goes to the fridge for water and drops the cap. Before he can bend to pick it up, Kang Hwi releases Chaton. Tae Ik freaks when he sees the cat. Enter Man Ok. He and Man Ok stare at each other and screaming ensues. Tae Ik sits gingerly on the couch and scolds Man Ok for bringing in a kitten. Man Ok says she bought it because she she was lonely after moving into his house. Doesn’t she know he’s allergic to all fur? Yes, she knows. This stuns Tae Ik. She knows and still did this? Man Ok then says she has a right to have a kitten in his house, doesn’t she? She’ll take care to ensure that he doesn’t know its there. Right? Right? Can she really say that while looking at him right now? There is no way that she can raise the kitten without him noticing. Man Ok says she’ll raise it in the basement. The basement? Man Ok says that if he insists on kicking the cat out, he’ll have to kick her out, too. They get into a staring contest until Tae Ik’s allergies flare up even worse. He backs off and tells her that the cat must stay in the basement or else it’s out. LMAO. He always gives in to her in the end. Man Ok is out shopping and two girls approach her asking about Tae Ik. She must have saved a country in her past life to be engaged to Lee Tae Ik. Man Ok then goes home where she gets a call from Kang Hwi asking her to get Tae Ik’s face care products since his face broke out. Man Ok quickly agrees. She calls Go Dong who says Tae Ik had business and had him go home for the day. Man Ok, believing the coast is clear, goes up to the sauna. She hits the light switch, but the lights are off when she enters. Oh? Dude, alarm bells should be ringing, girl. Especially since Tae Ik talks about conserving energy. If there was lights on to begin with, doesn’t that tell you he’s in the room? Tae Ik wonders why the lights went off and on and he exits the sauna as Man Ok is taking out his face cream. She turns and sees the naked man and the two start screaming again. Tae Ik then demands to know why she’s in someone else’s bathroom like a pervert. Man Ok says she just came to get something and then insists that she didn’t see anything. She then leaves after Tae Ik screams at her to get out. She then complains that he should lock the door if he’s showering. Enter Jin Se Ryeong. Man Ok is shocked. Se Ryeong confirms who she is and Man Ok tells her she must take her shoes off in someone else’s house. Se Ryeong then requests slippers. Man Ok says there are none left. Yes there are, on Man Ok’s feet. WHAT? Man Ok quickly takes her slippers off and puts them in front of Se Ryeong who then asks where Tae Ik is. Enter Tae Ik in his bathrobe demanding if Man Ok did or did not see everything. When he sees Se Ryeong, he stops in shock as she grins at him. Don’t tell me she’s moving in to the house as well? I hate her. I hate her and we’ve barely seen her yet. The previews make me hate her all the more. I’m excited for the next episode when Kang Hwi comes out of the basement. LOL. I can’t wait to see all the craziness in the previews. Here kitty kitty, HW now has his own cat to match the decor! I really loved it when Tae Ik took her hand before entering the room. You know it just wasn’t to look good. He was showing his concern and support. Melts. LOL. Tae Ik’s got a dirty mind 😉 Well, not really. It’s soooo cute how he just becomes obsessed with her lips. I STILL can’t believe Man Ok bought a kitty for him knowing about Tae Ik’s allergy. Not a bright idea, but the kitten is sooooo cute. And I LOVED how Man Ok managed to get Tae Ik to okay it’s living there in the basement. He’s such a pushover. Yeah, you have to love this couple. All the little things they do for each other. Man Ok’s little ways make him soooooo happy. It’s really cute. NMW is doing such an excellent job as is HJE. Loved; love this drama. Cute couple. I love it when she says his name and he kisses the picture on the night stand of them both. To cute. Fighting. Nothing wrong with that. Cute couple, not an overly angsty drama. I thoroughly enjoyed it.